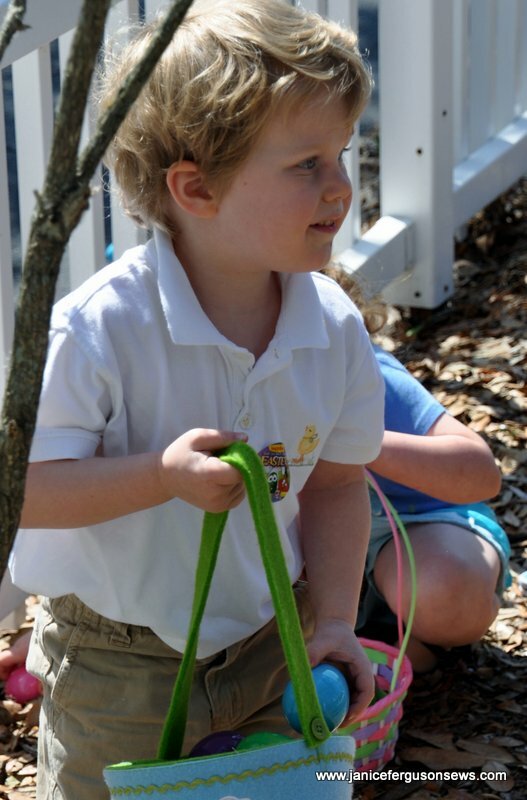 Saturday began with the Bunny Lunch at church, always a big hit with our grandchildren. Approximately 75 children along with their parents or grandparents participated. The event began with an Easter craft followed by lunch. I made the sandwiches on the white tray in the foreground with the carrot decoration. 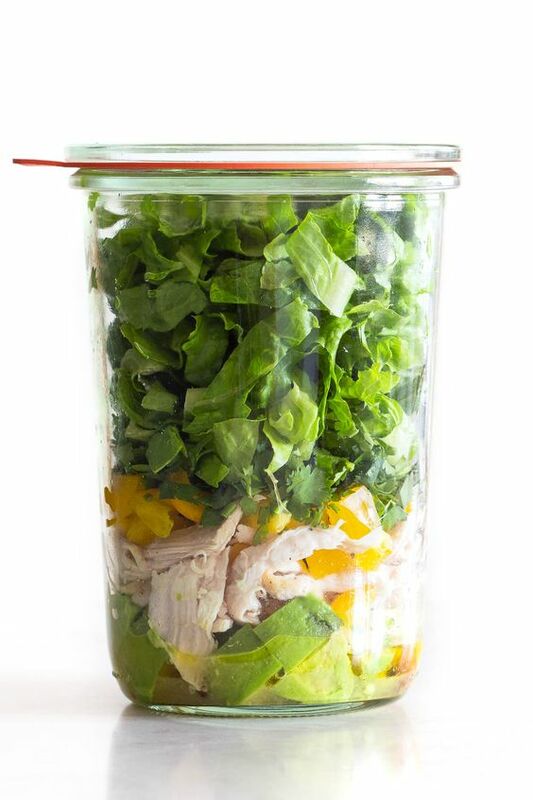 See below for details of an easy sandwich that children love. Then there was a visit from an Easter Bunny helper. It was so cute–the helper was costumed in a traditional fuzzy white bunny suit, but this suit has a cut out around the face which is meant to be painted. The daddy who volunteered to play the part has two young sons who were in attendance and he didn’t want them to be recognized. Before he appeared, all the children were told that he had to swim here, so he wore a scuba mask. Still, his older son recognized him right away and was quickly hushed by his mama. It’s true that you can fool some of the children some of the time, but you can’t fool your own children very often. Next came the kid-pleasing egg hunt. Our little ones were rabid hunters. Then there were family photo shoots. We rushed home to prepare dinner. 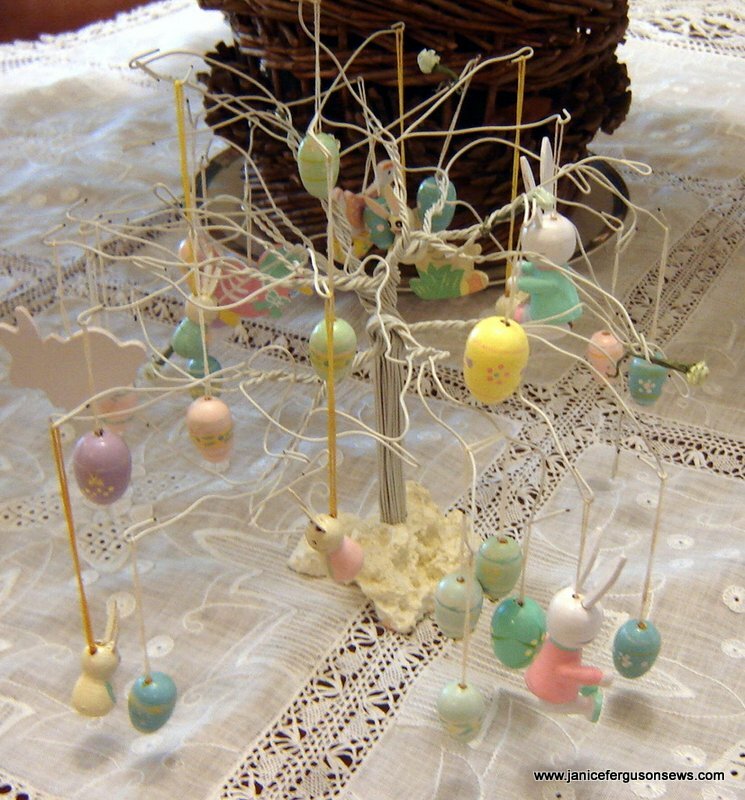 While the cooking went on, the children dyed eggs, decorated the Easter egg tree and put up the rest of the Easter decorations. They loved each of these activities. Ryan’s family spent Easter Sunday with our daughter-in-law’s family, so we didn’t see Robert and Laurel. 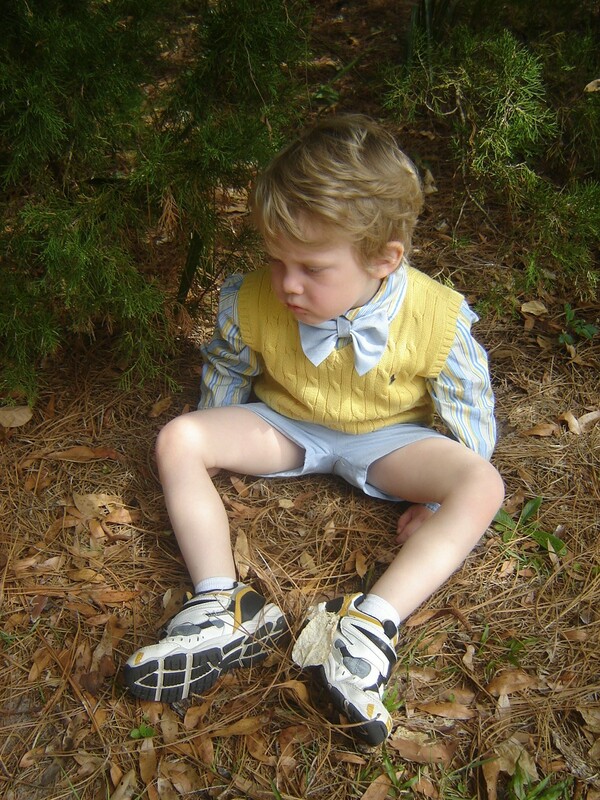 Alastair, 4, looking suave wearing the first bow tie I have ever made. There will be more and they will be better! 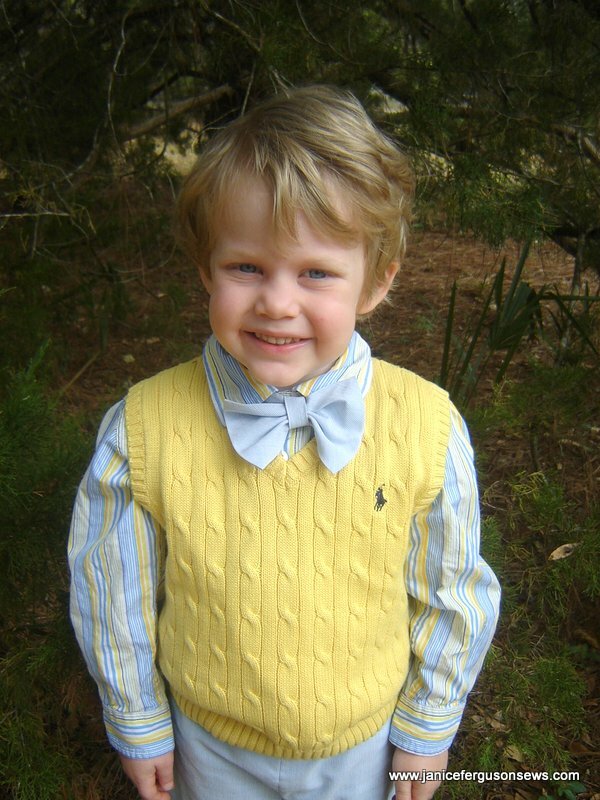 Alastair was so cute in his big boy outfit with his sweater vest and bow tie. The baby cord shorts are from his Easter outfit two year ago! This little guy wears size 3 pants and size 5 shirts. I made Alastair’s tie, but I want you to know it did look much better earlier in the day before he had been playing in the treehouse. His parents loved the look of that tie and so did I. Later, I will post a tutorial on how it was made, so quickly and easily and how to keep it from squirreling around as it did. Now, Rebecca wants one for every holiday and I look forward to accommodating her. Vivian Rose, 11 weeks old, slept most of the day. I missed the snap at the neck. 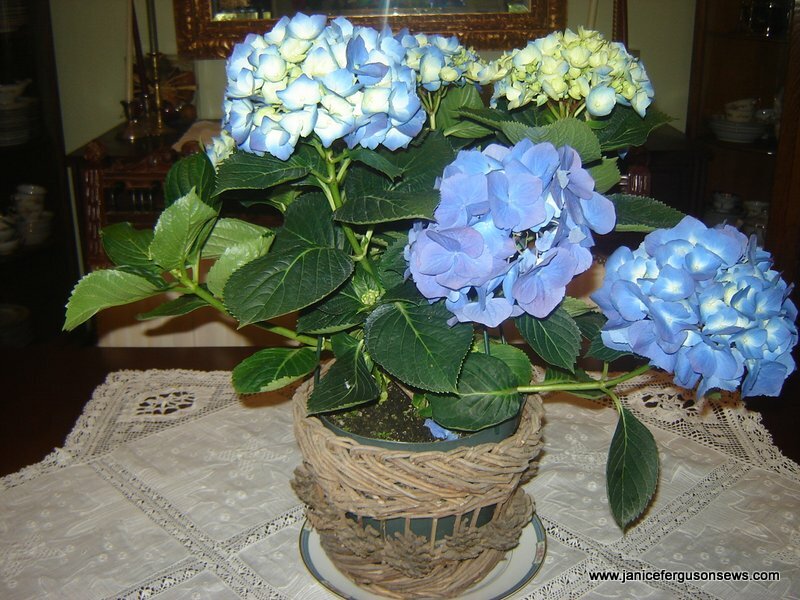 Alastair and Vivian Rose brought this exuburant hydrangea. 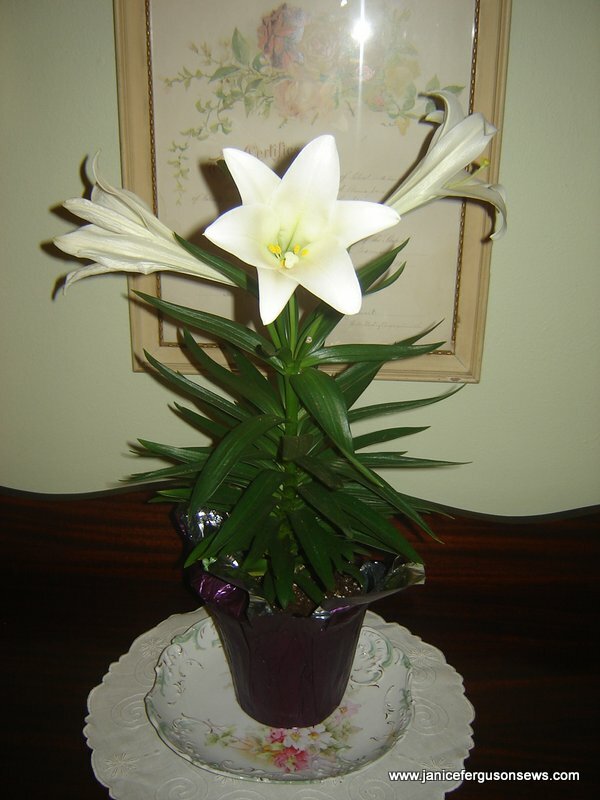 It is loaded with blooms and bud. 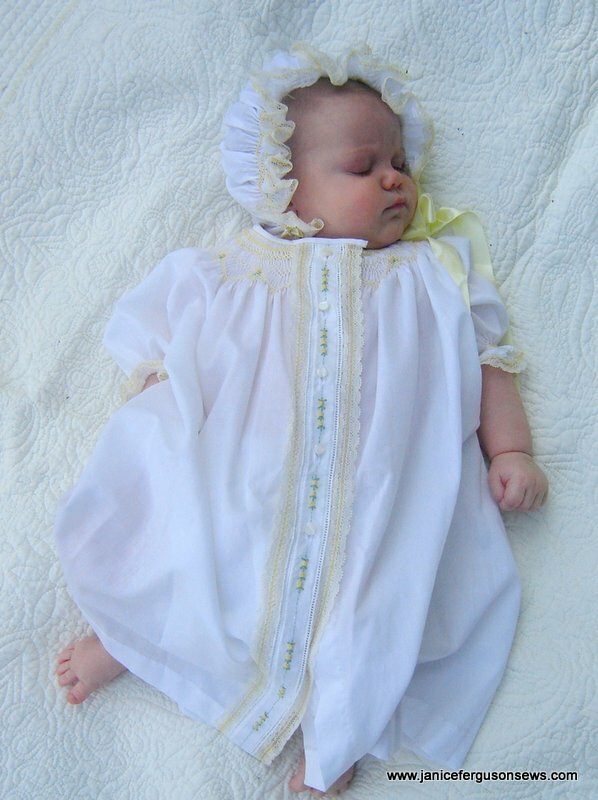 I put aside the Madeira bordered daygown I was working on for Vivian Rose’s Easter dress–that was a good decision. When she and her family arrived Wed. I decided I’d rather spend time with them than spend time sewing. 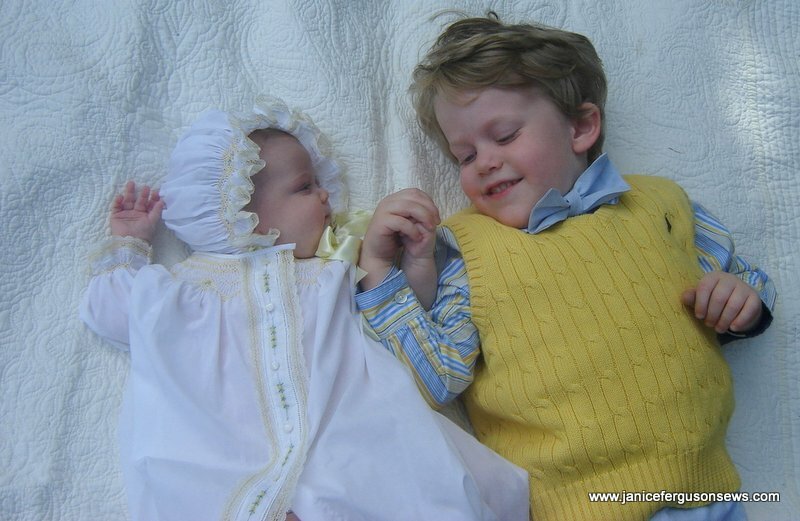 Besides, she had never worn this daygown and the yellow smocking and fagoting on the lace coordinated nicely with Alastair’s outfit. I’ll get back to the Madeira gown soon. I love her little frown look. It was very bright outside. She was tired of the picture taking. He had been a good sport for as long as he could. Back to the treehouse! I hope you all enjoyed this Easter holiday as much as the Ferguson family did. 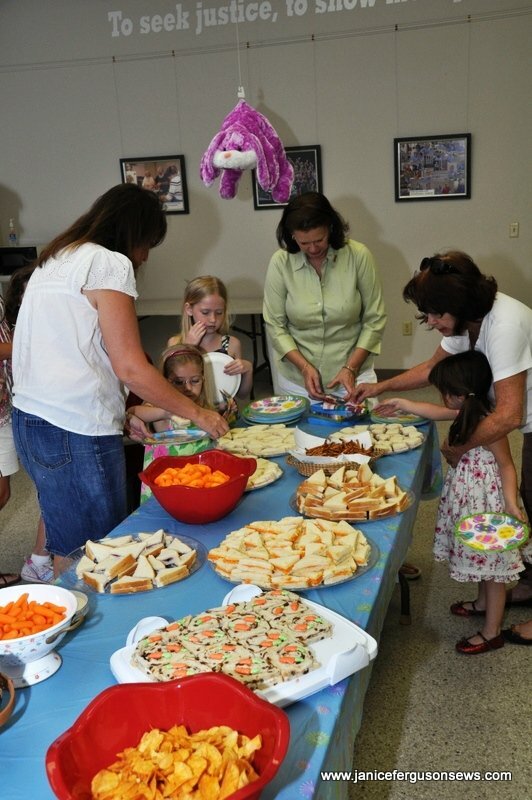 From the comments and inquiries from the adults at this event, you would have thought that these simple little quarter cut sandwiches were made from some gourmet recipe. This is the second year I brought them and the response was the same both times. I used 5 loaves of raisin bread so I am just guessing about the quantity needed for a smaller amount. Cut crusts from bread, 2 slices at a time. Spread with cream cheese then jelly. Cut in quarters. Whip cream cheese, vanilla and milk together with mixer. Add green food coloring to 1/4 of frosting. Add orange food coloring to remaining amount. Stuff frosting into the two pastry bags, with the small round tip on the green bag and the larger round tip on the orange bag. I placed the carrots along the long side of the triangle sandwiches. 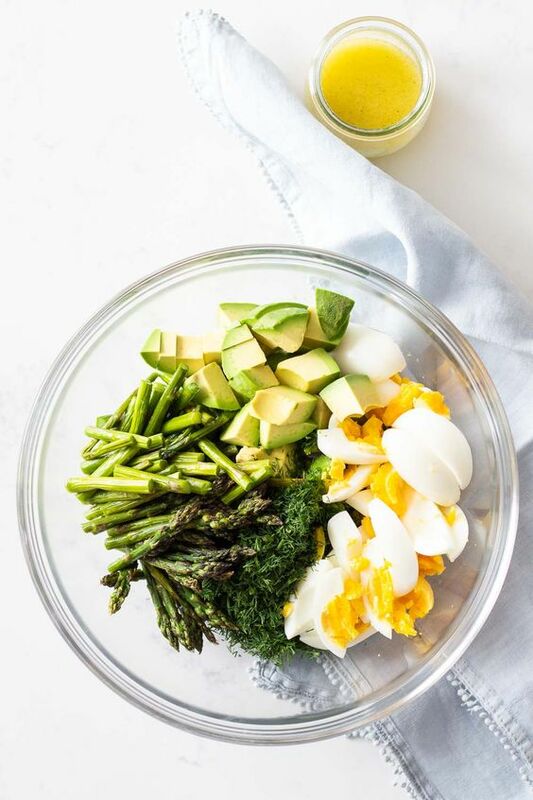 Make one or two lines for carrot leaves near top of one triangle. Frost each sandwich with carrot tops. With the orange frosting, start at the base of the leaves and squeeze a line of frosting, lifting the tip near the end so the frosting comes to a point. Frost no more than 20 carrots at a time if you want to add orange sugar. Otherwise, the frosting will be too dry for the sprinkles to stick. Sprinkle orange sugar on carrots for extra kid-appeal. Brush excess sugar from sandwich top with a pastry brush. Voila! Note: 5 loaves of raisin bread rendered about 100 quarter sandwiches. 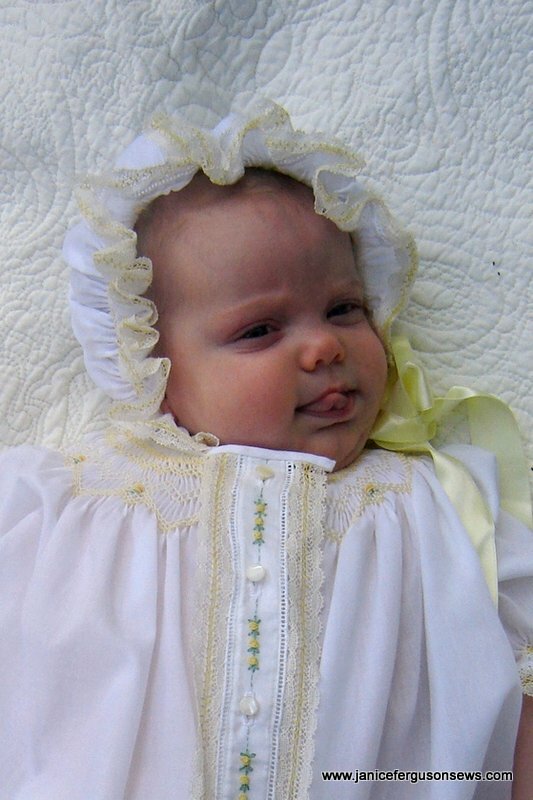 This entry was posted in boys, Holiday Projects, infant clothing, recipes, smocking. Bookmark the permalink. Happy Easter to you! And I just LOVE that picture of Alistair and Vivian! May they always be that devoted to one another! Thanks, Jo and Connie. The pictures of your Easter garments were so lovely! Right now, I’m about to finish smocking a pink gingham ready-to-smock bishop bubble for a church fund raiser Friday night. 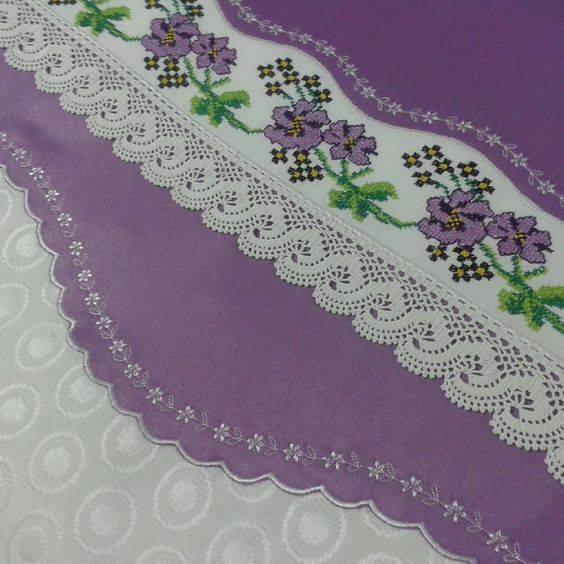 THEN at last I can finish the Madeira border gown I started for Vivian Rose and move on to a few bubbles for her. I love your posts about your family! 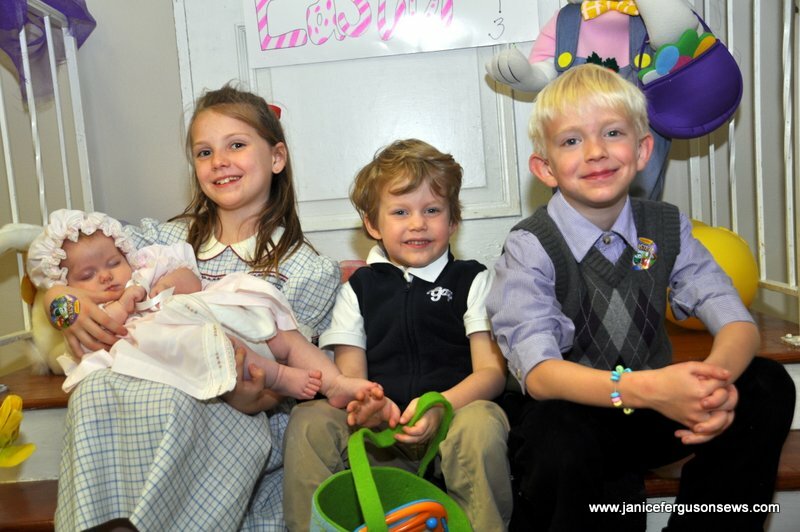 The children all looked splendid for Easter and the treats and activities looked delightful. Vivian Rose’s yellow trimmed gown and bonnet look absolutely gorgeous on her! Your children and grandchildren are so blessed to have you in their lives and you are blessed to have them. God is so good! Karen, I’m happy to hear that the posts about my family do not bore you. Our grandchildren are our greatest joy in life so it’s hard not to write about them. 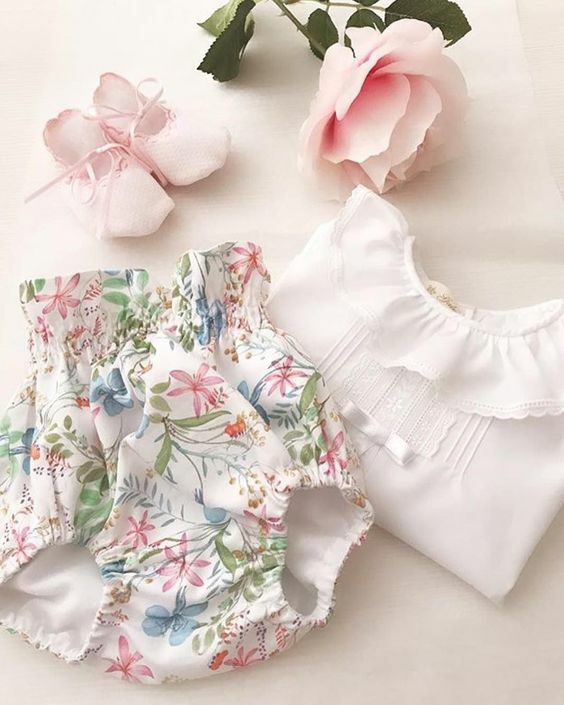 When you have a few, you will know just what I mean and I am sure you will be a wonderfully involved, loving grandparent. Now that is something for you to look forward to!